Please feel free to download and print the following Christmas Dot-to-Dot Puzzles for your parties, classroom or just if you feel like doing a puzzle. 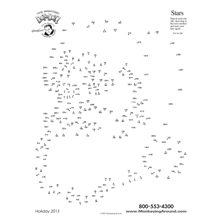 The large puzzle is from our Greatest Dot-to-Dot Super Challenge Book #5. The mini puzzle is from our Volume 2 Newspaper Book. 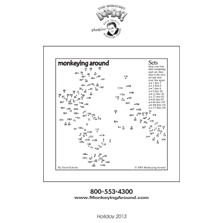 Our puzzles are recommended for ages 8-108. This puzzle will also be available for a FREE download on our Greatest Dot app on Christmas Day. TIP 1: Make a second copy of the puzzle and share it in a Holiday Greeting Card. TIP 2: Solve the mini Newspaper puzzles using the Q-Tip painting technique. This entry was posted in Free Holiday Puzzles. Bookmark the permalink.